Marchionne is now the fifth-largest shareholder in Fiat Chrysler Automobiles. TURIN -- Fiat Chrysler Automobiles CEO Sergio Marchionne has increased his stake in the automaker to 1 percent and nearly doubled his voting stake after exercising stock options and cashing in on a share price jump after a plan to spin off Ferrari was unveiled last week. Marchionne owns 12.1 million shares in FCA, equivalent to a 1 percent stake in the company, up from 0.65 percent he had before. The shares were worth $134 million at Tuesday's closing price in New York. Marchionne held 6.8 million shares before the transaction. Marchionne also has a 0.75 percent voting stake based on a total share capital of 1.6 billion shares, including loyalty shares, according to Reuters calculations. This compares to a 0.4 percent voting stake he held previously. The shares purchase makes Marchionne the fifth-largest shareholder in FCA, according to data compiled by Bloomberg. FCA's biggest shareholder is Exor, the Agnelli family's holding company. It has 30 percent of common shares and 46.6 percent of the voting rights. Other shares are widely distributed with various investment funds holding stakes of about 2 percent. Marchionne first exercised options that were due to expire on Nov. 3 for 6.25 million shares and the same number of shares in CNH Industrial, the truck and tractor maker that was spun off from the Fiat group, at a total price of 83.6 million euros ($105 million), filings with Dutch market regulator AFM showed. The shares were then sold on Oct. 30-31 at a total price of 94.3 million euros, according to the records, allowing Marchionne to benefit from a share price surge following the Ferrari announcement on Oct. 29. Marchionne later increased his FCA stake by exercising his remaining 10.67 million stock options. Only a portion of those shares were then sold "for the sole purpose of funding the strike price and meeting the relevant tax liabilities," FCA said. Marchionne said last week he would spin off Ferrari from the group, sell a 10 percent stake via a public offering and distribute the rest of FCA's stake in the luxury sports car brand to its shareholders. The spinoff is part of a bigger capital-raising plan that also includes a $2.5 billion convertible bond issue to help cut debt and fund an ambitious business plan at the world's seventh-largest carmaker. The stock jumped nearly 19 percent on the announcements. FCA, which moved its primary share listing to New York last month, wants to invest 48 billion euros ($61 billion) over the next five years to turn Jeep, Maserati and Alfa Romeo into global brands and rival Volkswagen and BMW by strengthening its position in the fast-growing and high-margin market for premium cars. 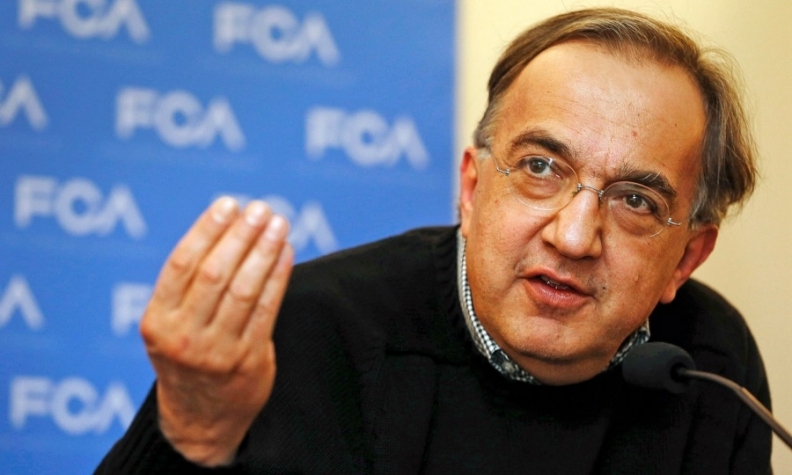 Marchionne, 62, has said he plans to leave Fiat after implementing the plan, which is due to run until 2018.